Embellished » Blast from the Past! Happy Tuesday! This week Julie and I thought it would be a fun idea to travel back through the Splitcoaststampers Tutorials and choose one we haven’t done in a long time! They really were SO much fun to look through! I really haven’t done much paper piecing at ALL, so I thought it would be just the time to do so! Here is what I came up with! Everything was pieced together. I turned the trees into clouds and then decided to cut the flowers out of the patterned paper instead of stamping them. I really had a blast with this one, especially after I added all the Icicle Stickles to it. 🙂 I cannot WAIT to see what Julie has done this week, make sure to run over there and see what she’s done! We’d love for you to play along! If you do, please link to our blogs or upload to Splitcoast using SFR22. Thank you so much for stopping by! Have a WONDERFUL rest of your week!!!! 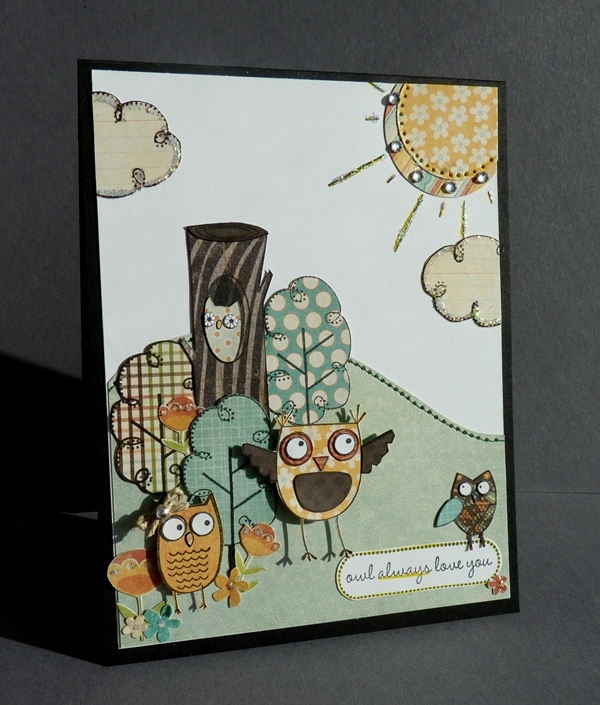 AWESOME ~ totally love the scene, and the woodsy colors you chose, PERFECTLY matches the theme of the card, L♥VE IT ! !